Place flour tortillas flat on the counter and cover 1/2 of each tortilla with shredded mozzarella cheese. 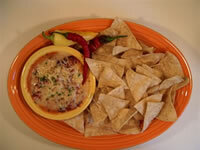 Then spread Gunther's Gourmet Black & White Bean Salsa over the cheese. Fold the plain half of the tortilla over the half with toppings so it looks like a half moon. Heat 1/2 of the oil in in a large saute pan (make sure the pan can hold two quesadillas without touching) and bring to medium high heat. Place two of the quesadillas in the pan and saute until golden brown, about 1 1/2 to 2 1/2 minutes, flip and repeat. Once both sides are golden brown, remove and place on cutting board and let rest for about three minutes. Follow these instructions for the remaining two quesadillas. Slice each quesadilla into three or four triangular pieces, arrange on plate (see picture) and top with diced peppers and Gunther's Gourmet Jalapeno Salsa Fresca. This is a quick and easy vegetarian recipe. For a heartier meal, grilled chicken breast strips, steak meat or cooked seafood can be added. 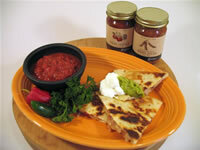 Slice each quesadilla into three or four triangular pieces, arrange on plate (see picture) and top with sour cream, guacamole and Gunther's Gourmet Salsa Fresca. In a large non-stick frying pan, melt butter over medium high heat - do not let butter burn. Pour in whisked eggs and stir gently and constantly with a wooden spoon. Continue stirring until eggs are to desired doneness and sausage and salsa are heated through. Taste and season with kosher salt and fresh ground black pepper if needed. Lay out tortillas on counter and divide the egg mixture evenly on the bottom third of the tortillas. Fold the bottom of the tortilla over the egg mixture and away from your body. Roll into a cigar shape. Place seam side down on a non-stick cookie sheet or a cookie sheet lightly coated with a vegetable spray. 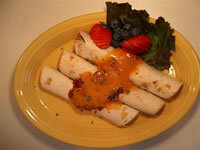 Place Burritos on entree plates and serve with fresh seasonal fruit. *Note - this is a very simple version of the dish, please feel free to jazz it up as much as you like with different cheeses, sauteed peppers and onions, chrizo, andouille, spicy sausage or whatever else you desire. 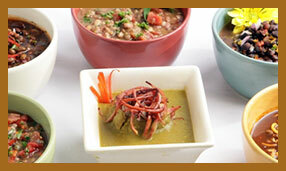 - This is a good dish to use up left over vegetables and scraps in your refrigerator. Take meat and divide into 4 6-ounce burgers. Pan fry or grill to desired doneness. 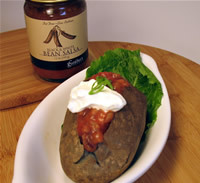 Heat Gunther's Gourmet Black & White Bean Salsa in a small pot over medium low heat. Put cooked burgers on roll and top with cheese. Place under broiler and melt cheese. Top with heated salsa, lettuce, tomato, onions and mustard or mayonnaise. Serve with pickles and fries or your favorite sides. Depending on your microwave, heat on high for 45 seconds to 2 minutes or until cheese has melted and sides of the dish bubble. Garnish with scallions or chives. This makes a great dip for fresh tortillas or a wonderful side dish for your favorite Southwestern or Mexican entree. Boil or grill your choice of hot dogs until cooked through. 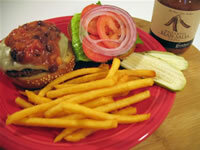 Place Gunther's Gourmet Black & White Bean Salsa in a small pot over medium low heat and warm through. Wrap Buns in foil and place in a 250 degree oven until heated and soft to the touch. 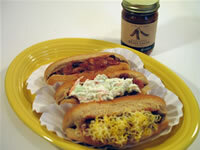 Place cooked hot dogs in the buns and top each dog with mustard, onions and Gunther's Gourmet Black & White Bean Salsa. Top four dogs with cheese and four dogs with coleslaw and leave four with just the salsa. Arrange them on a platter and serve.